Through hard work, perseverance and a faith in God, you can live your dreams. - Gateway to Canada | Canada Immigration Consultancy! Through hard work, perseverance and a faith in God, you can live your dreams. That's according to Benjamin Carson, an American author, politician and retired John Hopkins neurosurgeon. And if your dream is to live and work in Canada to give your family a better quality of life, there's Canadian Immigration Consultancy to assist you. 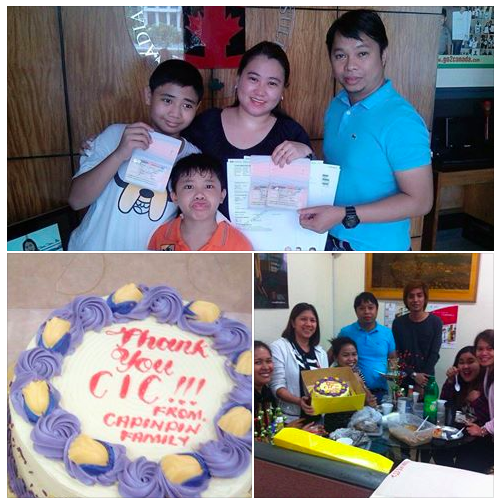 Mrs Capinpin and family with Canadian Immigration Consultancy staff. Canadian Immigration Consultancy assisted Mr. Dexter Capinpin and his family applied for permanent residence visa under the Federal Skilled Worker Program. Mr. Capinpin is a Registered Nurse. They will soon be moving to Canada. Small mistakes may cause huge problem. Don't take that risk. Contact and or visit our Alabang Office and learn your options.